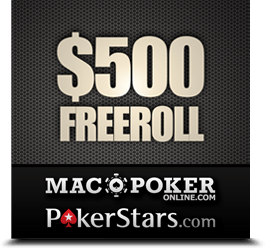 Mac Poker Online is ringing in 2011 with another $500 PokerStars freeroll. You have four weeks to qualify for our second of three private $500 freerolls. Our second of three giveaways kicks off on Saturday, Jan. 15, at 3PM EST. The event will be hosted by PokerStars and is open to qualified MacPokerOnline.com players who registered using the ‘MPONLINE’ bonus code. If you signed up for PokerStars and entered ‘MPONLINE’ as your bonus code, all you need to do is accumulate 100 Frequent Player Points (FPP) over the next four weeks. Qualify and you’ll receive an invite via email a couple days prior to kick off. The same goes for the third $500 freeroll of the series, which is scheduled for Saturday, Feb. 12, 2011, at 3 PM EST. For those who already signed up for PokerStars through using the bonus code ‘MPONLINE’, put away those FPPs and be looking for the invite. If you don’t have a PokerStars account yet, download it now on our review page use the bonus code ‘MPONLINE’ for a 100% bonus up to $600. If you have any questions about the upcoming freerolls, please contact us.